Constructed with TYR’s most durable textile, this Durafast Elite performance swimsuit utilizes high denier poly fiber and innovative circular knit construction to combine the strength and colorfastness of polyester with the comfort of spandex. Featuring a moderate coverage top and bottom, sleek/flexible straps and adjustable drawcord waist, TYR Dimaxback workout bikinis are perfect for swimmers who want minimal coverage with reliable support. TYR performance swimsuits are lined, provide UPF 50+ sun protection, 360 degree range of motion. All Durafast Elite suits are chlorine proof and sustain an impressive 300+ hours of performance. 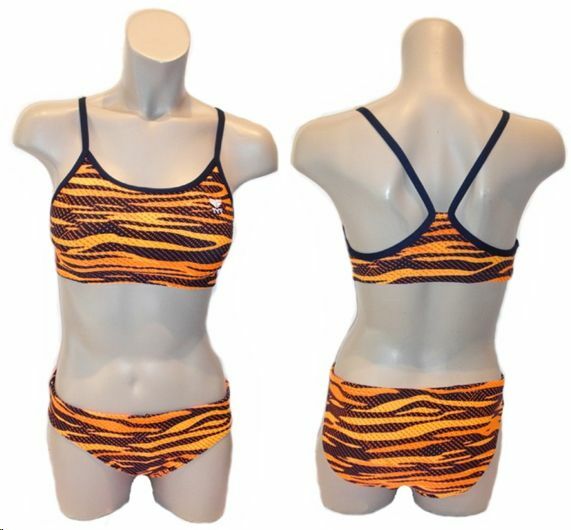 TYR Durafast Elite: 94% Polyester / 6% Spandex. The Halter Bikini has Removable Cups. The V Neck Tankini Bikini has removable cups, adjustable straps and a classic bikini pant. Constructed with Durafast Lite, this suit is 30% lighter weight than Durafast Elite swimsuits and allows for a 360 degree range of motion. TYR Durafast Lite swimsuits can sustain 200+ hours of use while maintaining a comfortable hold on your body. They also feature built-in UPF 50+ capabilities for ultimate sun protection. The Halter Bikini has removable cups and classic bikini bottom. The Twisted Bra Tank has soft moulded cups and adjustable straps. The Twisted Bra Tankini has soft moulded cups and a classic bikini pant. Constructed with TYR’s most durable textile, this Durafast Elite performance swimsuit utilizes high denier poly fiber and innovative circular knit construction to combine the strength and colorfastness of polyester with the comfort of spandex. Featuring a medium neckline, sleek and flexible straps, front and back lined, moderate cut leg and an open back, TYR Crossfit swimsuits are perfect for athletes who want reliable coverage that won’t weigh them down. Constructed with TYR’s most durable textile, Durafast Elite® this swimsuit utilizes high denier poly fiber and innovative circular knit construction to combine the strength and colorfastness of polyester with the comfort of spandex. Featuring a medium neckline, sleek/flexible straps, keyhole back, moderate cut leg and graphic print, the Diamondfit is ideal for athletes who want reliable coverage during every swim.